For about 20 years now I have had a quiet love affair with round headlight equipped VW Rabbits. We road raced them in college and I gained a big appreciation for the tough, fun, and ultimately interesting little cars. The ones we raced had fairly anemic 1.6L engines and make about 10% the power that the beastly creation in this video makes. Who in their right mind would ever see THIS coming?! 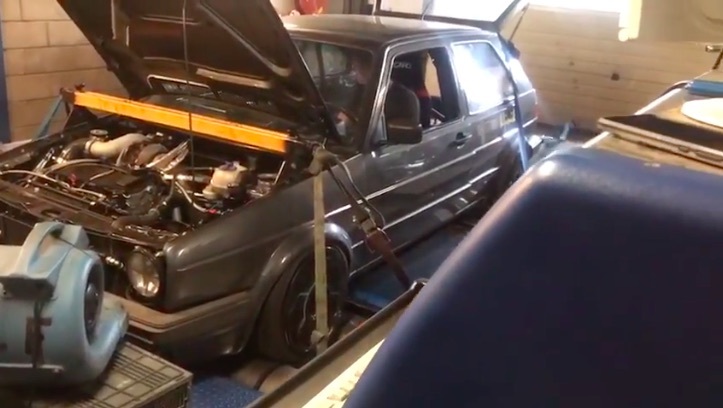 This car as a VR6 engine swapped into it and as you can see from the video a very significant turbocharger that is force feeding at least a couple of dozen pounds of boost down its throat. We have no idea what RPM it is spinning, no idea what kind of internal modifications have been made but we sure as hell know that this thing would swallow any Hellcat to Demon it saw whole. How can we make such a claim? This thing is all wheel drive! Holy cow what a rocket. Kill It Like You Mean It: Rallycrossing A Beater LTD Until It Blows Up! Day Two PRO Winter Warm-Ups, ’18 Mello Yello Fuel Champs Lead The Pack!